Marcel started writing in April of 99, and since, has compiled thousands of unreleased poems, as well as several novels. Originally beginning by writing novels, he started writing poetry several months afterwards, and since, has just released his 5th Spoken Word CD. He sees life, as nothing less than finding a passion and being dedicated to it, and in his work, he promises to capture the emotions and feelings of a number of different issues, from politics, love, self revelations, and the struggles that come with life. Marc Marcel has had poems published in several anthologies, and has guest featured on numerous other artists CDs around the world. He has appeared on television on such shows as The Poet’s Corner, and has appeared on many radio stations across the nation, either talking about his travels or having tracks from his CDs being played in rotation. Marcel has had articles and interviews printed in magazines like, The Rolling Out, Good News Magazine, and St. Louis Argus Newspaper. He was also a member of the 2004 Pensacola, and 2005 St. Louis SLAM teams. He took his first steps into the world of poetry when he first hit the Spoken Word scene in January of 2000, where since, he has traveled across the country, exploring all 4 regions (over 60 cities) performing and living off his poetry. 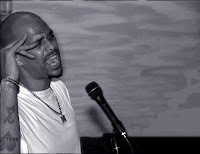 Marcel has also performed, done workshops, or spoke at colleges such as Harvard, MIT, Buffalo State, Georgia Southern, Louisiana State University, and Tennessee State University, along with appearing at many high schools, and Correctional facilities. Within the years that he has started performing, he has compiled a list of many historical venues that he has been featured. In the summer of 2004, Marcel then traveled across seas to perform in London, Bristol, Munich, and Prague. Famous Poetry: How Do I Love Thee? Stuff I Like: Roger's "Calypso"
Stuff I Like: Aaron Trumm "Blink"
Just For Fun: Last Day of the Facebook Fast! Just for Fun: Mow The Lawn Too Racy? Poet, Aspiring novelist, Recovering perfectionist. Student of Life.